Keeping in mind those numerous blogs that teach you the basics, I have been focusing on special topics only. In this post I will be creating a Search screen, which will have a table view with a search bar. Table should display all the records if search field is empty other wise it should show all the records that have matching strings with the search field. So to start create a new ViewBased Project and name it as MySearchScreenApp. You can start with any template you want but you can find in my previous posts why I always start with the most basic template. Here we have only defined the UIElements and some data sources. There are three mutable arrays. dataSource will be containing all the data and will be initialized before loading the searchScreen. searchedData will be holding a subset of dataSource based on search string. It will be contents of tableData which you will be viewing in the table below searchBar. As already discussed, dataSource will be holding all of data and tableData will be holding data to be shown in table. This code copies all elements of dataSource into tableData so that when the search screen is visible first time, all the data is displayed. If you do not understand the code above, you should refer my earlier posts. These methods will be displaying data in tableData array into our table view. if(r.location== 0)//that is we are checking only the start of the names. 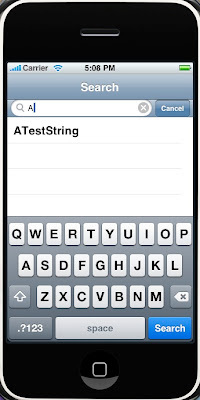 This method will be called whenever text in the search bar is changed. We should update tableData array accordingly. 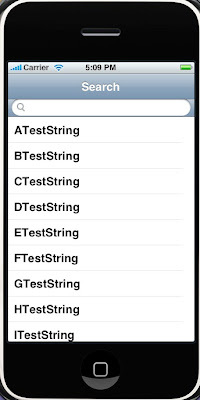 So the first line[tableData removeAllObjects]; removes all the searched records from previous search string. Then we check if the search string is null so that we should return immediately with and empty tableData. If the searchString is not null then we will go through each object in dataSource and select those objects which have the occurrence of search string in beginning. You can modify the code to have any kind of search though. The last line[myTableView reloadData]; refreshes the table view. What ever be the content of tableData will be shown now. In the first function, we have flushed all the searched records and simply copy all the records from dataaSource. In the second function we are telling the text pad to resign. You can skip this method to see what happens. Here we have only added dummy data into dataSource to test. You can always store data from database or anywhere . I hope this post was useful. I will suggest you shou should read Predicates to optimize the search if you have very large data source to be searched. Do you have xcode project code for this? Great Tutorial... Thank you very much. For some reason, though.. I can't get the data to load into the table when the app is initialized. It only loads after I hit the cancel button on the search bar. the [tableData addObjectsFromArray:dataSource] in the loadview method seems like it should do the trick right? Ved ... Can u please upload the code ?? I would love the source code for this tutorial. Thanks! the style in your blog is sadly nearly unreadable. anyway thx for this blog-entry. I get two errors with my viewController, (viewController.dataSource...). Here is the message : error 'ViewController' undeclared (first use in function). Hi, sorry for the late reply, I have been bzzy with other tasks. Please check if in the .h file viewController is injected by default or not. If it is something else, use the same name. Could you please explain why you're using NSAutoreleasePool here? I don think there is much need of autorelease pool there, but at the same time its harmless and can be helpful too.When the database is huge like in crm applications, the for loop might iterate large number of times and we are crating NSRange auto release objects for every iteration, so a new pool will ensure these objects are released immediatly after every iteration rather than stacking all the objects untill for loop ends and release them in next pool. How do I have the searchbar hidden underneath the navbar when it first comes up? you can try removing it from the view and add when required. You can also try changing the alpha value to 0. How do i do it if my source of data is from a plist file?can anyone help? I already have a text related app on iTunes. One thing it lacks is a search feature. I need help. I am a novice to developing. Someone developed it for me and wants to charge an arm and a leg for this feature. If you know anyone will to takes this task for a reasonable price I would appreciate it. Already spent a lot to develop the app. It NOW NEEDS A SEARCH FEATURE TO SEARCH WITHIN THE APP. @Learner, I am really short of time these days but send over your use case n ll try helping. wow, this code is full of bugs and the author don’t care for fixing them. Amazing! If you were lazy to create a decent post you shouldn’t. How do we make the search bar float and not scroll with the table view? one way is to add searchBar as a separate subview. Interesting post!!!! Thanks for sharing code for creating search bar. I am also an iphone application developer. I will try your code to create search bar. Well exposure of the application. When your apps get in the store, Apple will decide weather it will stay there or not. Does anyone know how to parse it with XML and make the data from the XML load in the searchbar? Very usefull code, it differs from others that is all programatically made.